Start in Iquitos and end in Nauta ! With the river cruise tour ARIA AMAZON - Explorer Cruise 4 Night - Low Water Season (June-October), you have a 5 day tour package taking you from Iquitos to Nauta and through Iquitos, Peru and Nauta. 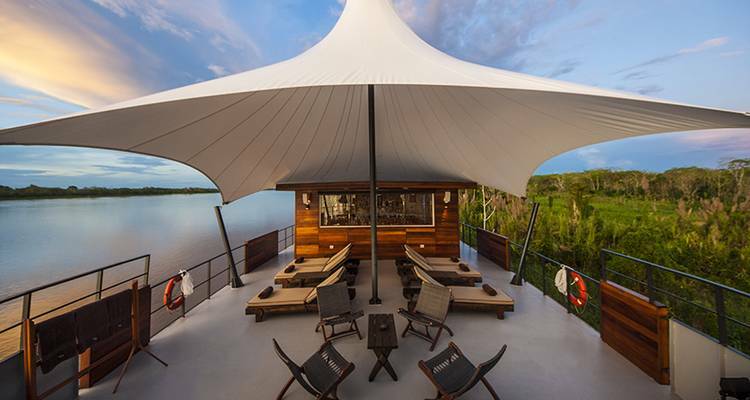 ARIA AMAZON - Explorer Cruise 4 Night - Low Water Season (June-October) includes accommodation as well as meals, transport and more. What Guests have to say? Do I need any shots before travelling to the Amazon? It is not a requirement to have malaria medication or yellow fever shots going into the region but they do recommend it. Aqua Expeditions also recommend you consult your physician for medical advice prior to your cruise. Instead of going on an organized shore excursion, can we go off on our own? Aria Amazon requires their passengers to stay with one of their naturalist guides when you are on land during your cruise, this is for safety reasons. What does my all-inclusive Amazon River Cruise price include? Your Amazon River Cruise price will include all of your meals, selected wines and beer, non-alcoholic drinks, beautiful suite staterooms, onboard lectures, entertainment of an evening, shore excursions with expert naturalist guides and the Pacaya Samiria Reserve entrance fee. If you book the recommended arrival and departure flights that Aqua Expeditions can provide you with then they will also offer transport to/from the airport. With so many inclusions in the cost, you will only have to factor extra spending on your airfares, cocktails, purchases from the boutique gift shop, massage services and gratuities. Communication has been excellent. All queries have been answered promptly. Further information about the proposed tour has been readily available. I feel confident booking through TourRadar. Recommended for Peru. Ideally 2 weeks before travel. Recommended for Peru. Ideally 3 months before travel. Recommended for Peru. Ideally 2 months before travel. Recommended for Peru. Ideally 1 month before travel. Recommended for Peru. Ideally 10 days before travel. Iquitos is the starting point and Nauta is the endpoint. TourRadar can request Aqua Expeditions to hold spaces for you for up to 48 hours without any credit card details. TourRadar only requires a deposit of $99 to confirm this Aqua Expeditions booking. The remaining balance is then payable 90 days prior to the departure date. For any tour departing before 21 July 2019 the full payment of $5,184 is necessary. No additional cancellation fees! You can cancel the tour up to 90 days prior to the departure date and you will not need to pay the full amount of $5184 for ARIA AMAZON - Explorer Cruise 4 Night - Low Water Season (June-October), but the deposit of $99 is non-refundable. Covering a total distance of approx 104 km. TourRadar does not charge any additional cancellation fees. You can cancel the tour up to 90 days prior to the departure date.